Sunset Strips™ is a new-generation 3-step deep pore-cleansing and refining system that methodically removes trapped dirt, excess sebum and impurities on the nose without harsh extraction. 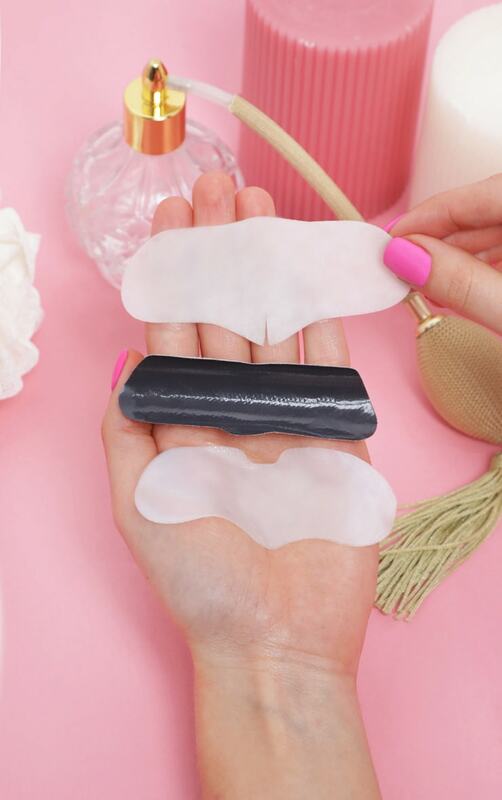 Each pack contains three mask strips: A skin-prepping mask loosens trapped dirt and debris; a powerful charcoal mask actively draws out all the excess sebum and pore-clogging impurities; and a soothing Bio-Cellulose mask nourishes and visibly reduces the appearance of pores. Use regularly to reduce the appearance of large and unsightly pores, and promote healthier and clearer skin. 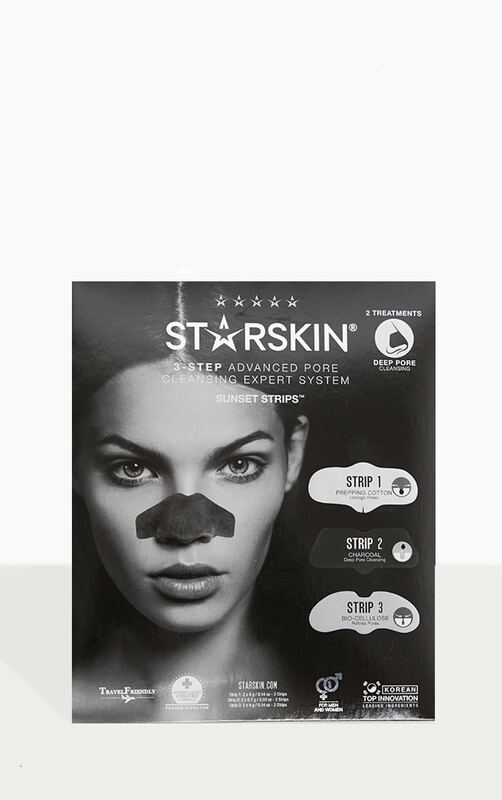 Strip, strip, strip your way to a more refined and beautifully smooth nose! Use regularly to refine pores, help prevent breakouts and achieve a smoother and more even-looking nose. Use once a week. Use immediately after opening. Cleanse face and pat dry. Tear open Strip 1 sachet and carefully unfold mask. Place mask on nose and smooth out. After 10 min, remove and discard. Using a tissue, wipe away remaining serum. Remove Strip 2 from sachet and moisten nose with a few drops of water. Remove clear film and place Charcoal strip with the black shiny side in contact with nose. Press firmly so the mask adheres perfectly to nose contours and do not adjust. After 15 min, gently remove mask in one single motion and wave goodbye to pore-clogging debris and impurities glued to the charcoal strip! Finish with Strip 3. Remove mask from sachet and peel away protective layers A and C. Place layer B onto nose and leave on for 10 min. Remove and discard. Gently pat in remaining serum. Do not rinse. Strip 1: Water (Aqua), Butylene Glycol, Hamamelis Virginiana (Witch Hazel) Water, 1,2-Hexanediol, Arctium Majus Root Extract, Juniperus Communis Fruit Extract, Melissa Officinalis Leaf Extract, Mentha Piperita (Peppermint) Leaf Extract, Salvia Officinalis (Sage) Leaf Extract, Viscum Album (Mistletoe) Extract, Hypericum Perforatum Extract, Peg-60 Hydrogenated Castor Oil, Phenoxyethanol, Saponaria Officinalis Root Extract, Allantoin, Ethylhexylglycerin, Xanthan Gum, Disodium Edta, Fragrance (Parfum), Sodium Polyacrylate, Linalool, Citronellol, Geraniol, Citral, Eugenol. Strip 2: Alcohol, Vinyl Caprolactam/Vp/Dimethylaminoethyl Methacrylate Copolymer, Silica, Water (Aqua), Peg-12 Dimethicone, Charcoal Powder, Titanium Dioxide, Allantoin, Aloe Barbadensis Leaf Juice Powder, Dipotassium Glycyrrhizate, Tocopheryl Acetate, CI 77499, Hamamelis Virginiana (Witch Hazel) Extract, Butylene Glycol, Phenoxyethanol, Camellia Sinensis Leaf Extract, Ethylhexylglycerin. Strip 3: Water (Aqua), Glycerin, Dipropylene Glycol, Glycereth-26, Alcohol Denate., Betaine, Glyceryl Polymethacrylate, 1,2-Hexanediol, Peg-60 Hydrogenated Castor Oil, Phenoxyethanol, Hydroxyethyl Acrylate/Sodium Acryloyldimethyl Taurate Copolymer, Propylene Glycol, Ethylhexylglycerin, Carbomer, Arginine, Disodium Edta, Fragrance (Parfum), Tocopheryl Acetate, Butylene Glycol, Eucalyptus Globulus Leaf Extract, Calendula Officinalis Flower Extract, Linalool.